Only 15% of Nepalese households have access to electricity. 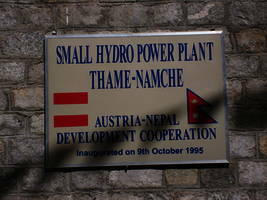 Therefore Austria has financed the construction of a hydropower plant in Thame - Namche Bazar in the Mt. 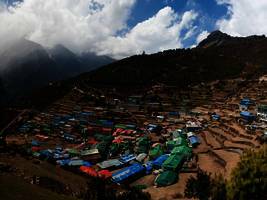 Everest region, located at an elevation of 3800 m.
The plant has a capacity of 600 kW and supplies eleven villages and one monastery with electric power. The growing numbers of tourists passing through the area had led to an increase in the demand for fuelwood, with alarming deforestation in the Thame valley. Cooking with electricity has reduced firewood consumption by one third, thus preserving the mountain forests. Moreover, the steady supply of electricity has encouraged the growth of small enterprises and promoted an ecologically-balanced tourism. In 1992, Eco Himal took over full responsibility for the technical and financial management of the project, including the training of a local Sherpa team. 85% of the power plant shares belong to local user groups and only 15% to the state-owned electric utility. A socially graded tariff system ensures that even the poorest farmers in the region can afford electricity. In May 1994, the "Khumbu Bijuli Company" was formed and registered. It is managed by elected representatives of the local user groups; since 1999 it has been fully responsible for the operation and management of the power plant. The cleaning of the pen-stock pipe at the end of 2000 marked the completion of Eco Himal’s direct involvement in the project. In March of 2008, necessary maintenance work was carried out to ensure continued functioning of the plant.